White, yellow, orange, green, blue, purple and black, the colors of martial arts belts denote student development, skills and experience. However, contrary to popular belief, using colored belts to denote rank or ability in martial arts is a relatively recent invention in the otherwise ancient arts- one that was only introduced around the turn of the 20th century. A well-regarded teacher and polymath in his home country of Japan, Jigorō created judo from his study of jujutsu in the late 1800s. Shortly after creating judo in the 1880s, Jigorō began awarding some of his students the rank of Shodan, literally “beginning degree,” which is the lowest black belt rank, first bestowing this rank on Tomita Tsunejirō and Saigō Shirō. This ranking system was inspired by the existing Dan ranking system in Go, devised by Honinbo Dosaku in the late 17th century. Prior to this, more experienced students in various forms of martial arts in Japan tended to be given scrolls indicating their abilities. In these early days of judo, the students did not wear the garb we today associate with many forms of martial arts. 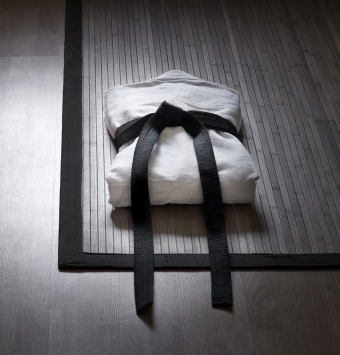 Rather, judo was practiced wearing a traditional full length, light robe (kimono) secured with a belt (obi). In 1907, Jigorō introduced the modern uniform (judogi) and its thinner obi, although the colors were limited to black for yudansha and white for the less experienced (mudansha). The judogi‘s white denoted simplicity and purity, and the white belt of the neophyte showed that the student began empty, but eventually was filled with knowledge (which, as the opposite of the simplicity of the pure, was shown with the black of the yudansha’s belt). Over time, and to recognize even greater levels of achievement and skill, by around 1930, Jigorō had incorporated black belts with red and white panels (the red denoting the sacrifices made and desire to learn), and awarded these (kohaku obi) to what are today known as 6th, 7th and 8th degree black belts. Another judo master, Mikonosuke Kawaishi, who was teaching in Paris, is credited with incorporating other colors into the uniform around 1935, as a way to motivate his students toward even greater achievement. In short order, masters of other disciplines, including karate and tae kwon do, adopted the colored belt system, as well. According to Nolan Bushnell, the Atari gaming system was named after a term in the game Go. In that game, when you are about to capture another player’s piece, you say “atari”, which is somewhat equivalent to “check” in Chess. The word itself is derived from the nominalized form of the Japanese word “ataru”, meaning “to hit the target”. Elvis had a black belt in Karate and loved the martial art so much he gave his instructor $50,000 to start a Karate school in Memphis. He even once, when attacked while performing, used his Karate skills to physically toss a man off the stage before security could get to him. Later, a Karate instructor named Mike Stone that Elvis had recommended his wife go see ended up having an affair with her. Elvis’ rage at the man grew so frantic that at one point one of his body guards and long time close friend, Red West, was concerned for Elvis’ health over the matter and considered hiring a hit man to kill Stone. However, Elvis eventually moved on and the plans to have the instructor killed were canceled. A common myth is that the origin of colored belts in martial arts derived from the practice of never washing one’s belt; so gradually over time, it would turn black as one became more experienced. Beyond there being no evidence supporting this theory, and plenty of evidence supporting the real origin, cleanliness was, and is, traditionally stressed in many forms of martial arts, so a student choosing not to wash his or her belt would likely have not been allowed to train. However, the myth that this is how the origin of the colored ranking belts started has led to a very small number of martial arts schools today having their students not wash their belts. Today in judo, the belt color for adults are used only for the mudansha (yudansha ranks wear black, with the white and red panels at higher ranks). These colors may vary slightly depending on your organization, but, for example, JFA Inc. ranks the colors (from least to most) as white, yellow, orange, green, blue and brown. According to the American Tae Kwon Do Association, belt color by rank (again from lowest to highest) is white, orange, yellow, camo, green, purple, blue, brown, red, red/black and black. In karate, the belts also have deeper meanings assigned to them today: white represents birth and a new seed, yellow the sunlight that works on a new seed and begins its life, orange the power of the sun to help the seed grow, green is seen as the plant sprouting, blue is the sky the plant grows toward, purple represents the sky at dawn, brown the ripening of the plant, red is again seen as the sun and black is the darkness beyond it. The progressing colors listed for Tae Kwon Do is not universally true. I studied in the Kukkiwon school of Tae Kwon Do, but our color system (at least in my school) was white, white w/ yellow stripe, yellow, yellow w/ green stripe, green, green w/ blue stripe, blue, blue w/ red stripe, red, red w/ black stripe, black (1st dan). At my TKD, the belts were: white, yellow, orange, green, blue, purple, red, brown, brown 1st degree ( brown with a black stripe running down the middle), then black.